Pokemon’s newest set for the Pokemon TCG is finally here, releasing in hobby stores on May 1st, 2017 and getting its official retail release on May 5th, 2017. The set has 169 total cards when counting secret rare cards, with 12 new Pokemon GX and 3 Full Art Supporter cards. For this review I am going to switch up the format again and go through the cards by type. Worry not though, categories based on how good the card is are still used in this review, they’re just displayed now in a new and exciting manner. Additionally, I added the category of “Very Solid Card” for cards that should definitely see play, but who also don’t seem good enough to warrant heaping the praise of Star status upon them. To find a specific card that we’ve reviewed, check the card index. Otherwise go to the card category listed below. Victreebel’s Pollen Hazard is one of the best Special Condition attacks that they have released in recent memory. At a minimum you are going to be doing 50 base damage off of a single Pollen Hazard, with potentially more damage if their Pokemon remains stuck in the active slot and takes additional Poison and Burn damage, as well as potentially Confusion damage if they try to attack. Stick and Absorb is a solid follow up attack that can be powered up with an additional Double Colorless Energy attachment that could be good for finishing something off after striking it with a Pollen Hazard. As a Stage 2 Pokemon, it most likely won’t see play, especially after Forest of Giant Plants rotates out of Standard, but for the next few months I think there is a little bit of potential for a pairing with Vileplume to create a classic Special Condition Vileplume deck, something somewhat similar to the Lilligant deck from 5 years ago in the HGSS-NXD format. Having a Grass Phantump is significant as it will give players access to a pre-evolution that can take advantage of Forest of Giant Plants for turn 1 evolutions. You will be able to evolve into a variety of different Trevenant’s with FOGP, most notably the new Trevenant in Guardians Rising and the XY Trevenant in Expanded. I think this card is being underrated in the Expanded format, with many players writing it off as something to be ignored as you can already evolve into Trevenant XY with Wally. However, I think these players have tunnel vision on the types of Trevenant decks that can be built in Expanded, solely focusing on the Trevenant BREAK damage spread/disruption variants. If I were to use a Forest of Giant Plants engine to evolve into Trevenant XY, I wouldn’t be looking to attack with Trevenant (as Dimension Valley is important in attacking with the Trevenant BREAK line), but instead using it to pair with some hit and run attacker, such as Accelgor DEX or Gengar EX. It should be noted that the Forest of Giant Plants engine is more consistent than the Wally engine for setting up your strategy as you aren’t forced to use your Supporter for the turn to pull off the turn 1 evolution. I think this Trevenant is Pokemon doing a mulligan on Noctowl BKT, which has a similar attack to Trevenant, but who never was quite good enough to see play. I think they wanted decks built around this card, in particular Noctowl/Vileplume, but they made Noctowl too underpowered for effective decks to be made around it. They did release Noctowl BREAK which boosted the damage even further, but that is essentially a Stage 2, so its attack was never worth the resources needed to get it into play. Trevenant’s Poltergeist gets a damage boost over Noctowl’s High Flight, doing 30x damage instead of 20x damage, letting the damage scale quicker. Additionally, Noctowl only targets Item cards, while Trevenant targets all Trainer cards, so in addition to Items, Supporter and Stadium cards will also be adding to its damage output. About half of most decks are Trainer cards, so there will be lots of opportunity to boost up Trevenant’s damage, especially if you lock your opponent’s ability to use Items with Vileplume AOR. Combined with the regulations of only being able to play 1 Supporter or Stadium Card per a turn, there is going to be plenty of hands that Trevenant can punish for high damage. As it’s a Grass type Pokemon, you can use Forest of Giant Plants to evolve all the way to Trevenant BREAK in one turn. Trevenant BREAK not only boosts its HP, but it gives it Silent Fear as a mix up attack (Poltergeist is Colorless so you can run Psychic Energy as your Basic Energy type), as well as allow you to change types, giving you more type coverage both for changing what you hit for Weakness as well as your own Weakness. Its Horn Leech attack is awful and very costly so you will probably never even built a Trevenant deck with keeping that attack an important option for the deck ever. In a format mostly ruled by Pokemon EX and Pokemon GX, Golisopod is dealing out a lot of damage. Against any EX or GX Pokemon it will be doing 150 damage, which can be boosted to 180 with a Choice Band. That’s a lot of damage for only [G][C][C]. It isn’t the easiest thing to setup as it is a Stage 1 that requires two Energy attachments to power up Resolute Claws, but once it is powered up it’s going to shower damage down on EX/GX Pokemon. Unfortunately, especially for GX Pokemon, this damage might not end up being enough. 180 damage, for example, would still not be enough to OHKO something like Umbreon GX or Lurantis GX, so it’s still only in 2HKO range. 180 damage is pretty solid for OHKO’ing most basic EX and GX Pokemon, but not all of them. Ultimately, while the damage numbers are eye popping, its Energy cost and the new power creep of higher HP on GX Pokemon probably makes those damage numbers less effective than they would seem on the surface. 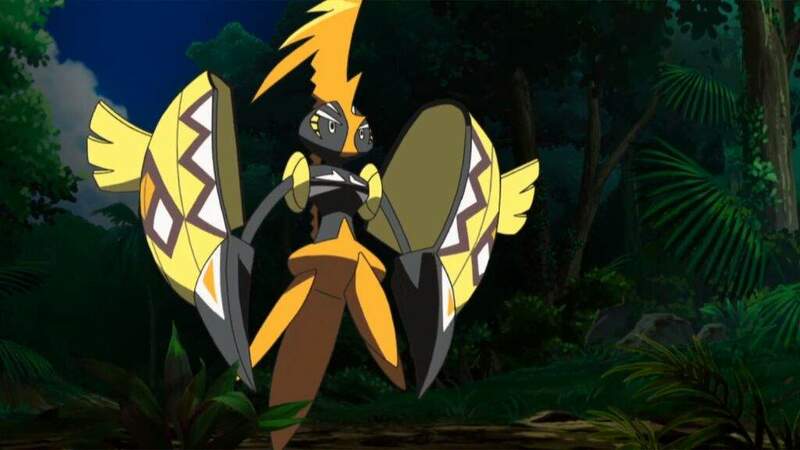 The Armor Ability is nice, and could be the difference it needs to try to gain the knockout edge against EX or GX Pokemon. Additionally, it could struggle against EX/GX decks with strong non-EX/GX attackers, as well as non-EX/GX decks in general. I think this card’s future is unpredictable. Its positioning in the format will largely depend on what GX’s end up being good and if it gets any additional support, in particular in the Energy acceleration department. Originally released in Sun and Moon, Decidueye GX has partnered up with Vileplume AOR to become the most dominant deck of the season. In Guardians Rising, Decidueye GX is reprinted as a Hyper Rare. If you’re a fan of the new artwork, but not a fan of Hyper Rare cards, there is going to be a Decidueye GX box which includes a promo copy of the Full Art version of the card. This Victini is a reprint of the Victory Star Victini from Noble Victories. We’ve seen what this card can do in the past It has seen success in two different fashions: Being the backbone of a deck where coin flips are crucial to the core strategy (Vanilluxe/Victini/Vileplume; Lilligant/Vileplume, etc.) as well as a tech inclusion to add depth of strategy by adding consistency to niche attacks in decks (Thunderwave with Tynamo in Eelektrk/Rayquaza EX decks for example). Victini’s success will ultimately hinge on whether or not Pokemon releases good flip cards that make Victini worth playing. It seems like there has been more of an emphasis on Special Conditions in the early Sun and Moon sets, so my prediction is it will probably find somethign to partner with. Once again Pokemon makes a new card for one of my favorite Pokemon and make it underwhelming. In no way is an Ability that lets you move 1 damage counter from one of your Pokemon to your opponent’s Pokemon per a turn worth running a Stage 2 line for. The only way this Chandelure becomes relevant is if another Chandelure card that is better is released and this can be used as a 1-of to add a mix up attack or some depth of strategy by creating a combo for that Chandelure and Shady Move. I would keep a few copies of this in case a Chandelure GX is released that could spring this card into some minor relevance, but most likely this new Chandelure will amount to nothing. Oricorio is a potential tech inclusion in Fire decks going forward. A Call for Family style attack for 3 Pokemon is very powerful and can help decks get setup, either by flooding pre-evolutions, or doing something like getting multiple Volcanion EX into play, which could be something you would want this for after Hoopa EX rotates and it becomes more difficult to setup Volcanion EX decks. I’m still skeptical towards this type of attack, however, as playing some count of Nest Ball in addition to Ultra Ball seems like a potentially better means of spamming Basic Pokemon into play. The Kindle attack is pretty solid in the context of Volcanion EX decks. It hits for enough damage to 2HKO stuff, and discarding an Energy from your opponent’s Active Pokemon will set them back 1 Energy attachment, which could push a game into your favor by putting your opponent an attachment behind. These types of Abilities usually don’t see much play, but with the new Burn rules, this is a guranteed 30 damage off of your Ability to the Active Pokemon, with the potential to be more if they don’t retreat. It lacks the versatility of where you can place the damage compared to the Crobat PHF line, but its overall damage potential is greater and Status Condition damage can be used to evade the effects of cards like Focus Sash and Exp. Share. It’s attack isn’t very good though, so you would have to play it solely for its Ability, which limits its usability. We’ve seen Raichu/Golbat have some limited success this season, so I could see people fitting this in a deck like Raichu for a damage boost. Being able to Paralyze something for significant damage when powered by Steam Up seems solid on the surface, but as more and more of these niche fire attackers are released, I realize in general just focusing on getting OHKO’s with Volcanion EX is much stronger than playing around with flimsier strategies. Turtonator GX will give a big boost to Volcanion EX decks by giving it some super powerful Energy acceleration. As is, Volcanion EX decks don’t have a GX attack to use in their current form, so Turtonator will give the deck a GX attack for the first time. The primary reason you would play Turtonator GX would be for its Nitro Tank GX attack, which lets you accelerate 5 Fire Energy from your discard pile. This is an insane amount of acceleration and is super powerful. It will take some experimenting to figure out whether Nitro Tank GX is best used early in the game, or in the mid or late games, or if it works well in the deck during all three stages of the game depending on the matchup or other factors. One cool thing about Nitro Tank GX having turn 1 potential is you can use it for a fast setup of your deck, and then unlock the new Hala Supporter card to draw you 7 cards for the rest of the game. I think against Aqua Patch decks a very fast Nitro Tank GX will be key for allowing Volcanion decks to keep up with the new speed of Water decks. Both Trap Shell and Crimson Flame are solid attacks which makes Turtonator GX a solid alternate attacker to Volcanion EX. Crimson Flame can be used to OHKO, doing 30 more damage than Volcanic Heat, giving you a bit more reach towards higher damage numbers. You have to discard 2 Fire Energy attached to it when you attack, but Volcanion EX decks are loaded with so much Energy acceleration this isn’t that big of a deal. Trap Shell gives you a two Energy attack that you can use for 2HKO’s when powered up with Steam Up, while also being disruptive and can be outright punishing if the opponent can’t do anything. For example, if you use Trap Shell for 110 (3 Steam Ups), and then the opponent can’t get their Pokemon out of the Active slot they may need to give up attacking that turn if their Pokemon will be knocked out from the 80 damage counters that would go on it if they attacked. Turtonator GX should lock Volcanion EX into being at least a Tier 2 deck through the remainder of its lifespan. Originally released in Sun and Moon, Incineroar GX has yet to get a foothold in the format and the release of Aqua Patch to strengthen Water Pokemon probably puts the final nail in the coffin of Incineroar GX ever seeing competitive play. In Guardians Rising, Incineroar GX is re-released as a Hyper Rare. If you like the new artwork, but don’t like Hyper Rare cards, the Full Art variant of Incineroar GX will be released as a promo card in an Incineroar GX box. Alolan Sandslash gives us continuous Ability based draw for the Sun and Moon-on format. It’s not as good as past variants of this draw Ability, such as Musharna NXD or Slurpuff PHF which had additional effects, but it could end up being the best of its kind for the Sun and Moon-on format. In the context of this set, it gives an immediate out for drawing the cards you place on top of your deck with Mallow, so we could see this combo come into play for players that want a more deliberate and calculated style of gameplay. Whether that ends up being as good as or better than going for raw draw power will have to be seen, but with no Discard and Draw 7 effect on a Supporter card in Sun and Moon-on, this could be the direction gameplay will head. Its Smash Turn attack is too costly to build a deck around. It has a cost free setup attack in Beacon. As far as setting up a field of pre-evolution Pokemon, Beacon is worse than traditional Call for Family attacks since it doesn’t put the Pokemon directly into play so you have to play them down on your next turn, allowing them to be N’d away, or at the very least not being able to be evolved from them next turn as you have to put them into play that turn. It is superior in the context of Abilities such as Shaymin EX’s Setup and other coming into play Abilities. It’s also notable in that it can search out evolution Pokemon, allowing you to use Vulpix as a potential setup engine for evolution decks, or at the very least Alolan Ninetales GX decks. Alolan Ninetales GX has seen some success in the younger age divisions in Japan, but I am not seeing any reason for why it should be a successful card over here. Being able to snipe 50 damage with its Ice Blade attack for [C][C] is very strong and its Ice Path GX is essentially M Mewtwo EX’s Damage Change, which could be put to good use. Outside of that though, the card seems lackluster. Blizard Edge does 160 damage, but forces you to discard 2 Energy attached to Alolan Ninetales. Given Alolan Ninetales’ status as a Stage 1, I would rather play Lapras GX as it has the same damage output on a Basic and I think resetting a Lapras GX to attack consecutively is probably better than having to discard two Energy. It’s always worth taking a look at cards that let you cheat around typical evolution rules, so Politoed is worth a look. However, using resources to setup a Stage 2 could just be used to evolve through the lines traditionally. I also don’t think there are any Poliwrath in format that are worth playing, they’re all very bad. Maybe a good Poliwrath is released in the future, making this card okay, but even then this card probably isn’t worth running. I think if you wanted to play this card, it would only really be viable in Expanded, using Archie’s Ace in the Hole to get a turn 1 Politoed to start setting up your field. This is an odd little card. Its Schooling Ability lets you switch this Pokemon with a Wishiwashi GX in your hand. This card can be used to increase the number of good starters in the deck. With free retreat, it’s a solid starter as it would let you use Max Elixir and Aqua Patch to benched Pokemon on the first turn and then retreat into them. Outside of that, I’m not sure if it has much utility. It seems questionable to devote significant resources to it before converting it into a Wishiwashi GX because of how easily it’s knocked out. Wishiwashi GX has an enormous 210 HP for a Basic Pokemon. Its primary attack, Microburst Vortex requires a massive 5 Energy. Typically this would be well past what is feasible, but with Aqua Patch, Max Elixir, as well as Palkia EX as potential Energy accelerators it may not be as bad to setup as it first appears. 120 damage isn’t great, but discarding a Special Energy can be pretty disruptive. Its Blue Surge GX attack does a solid 220 damage which will knockout most stuff. Moving the Energy off of Wishiwashi GX can let you setup multiple other Pokemon (maybe a pair of Lapras GX?) to finish out the game. With its high HP, it also has the potential to be the spiritual successor of Wailord EX as part of a stall deck, and it could be a cool tech option in Archie’s Blastoise in Expanded. I don’t think building a deck around Wishiwashi GX will ever work out too well because of the massive attack costs, I do think that it has the potential to be a good 1-of attacker in other Water decks that come about. Originally released in Sun and Moon, Primarina GX has yet to gain a foothold in the format. It does gain Aqua Patch in this set to boost the damage of its Bubble Beat, but that attack still doesn’t seem worth evolving into a Stage 2 for, even with the new acceleration available to Water Pokemon. In Guardians Rising, Primarina GX is re-released as a Hyper Rare. If you like the new artwork, but don’t like Hyper Rare cards, the Full Art variant of Primarina GX will be released as a promo card in an Primarina GX box. One of the cool things about the Sun and Moon sets is that Pokemon hasn’t been afraid to release GX and non-GX versions of Pokemon from Sun and Moon. This allows for some pretty cool deck building options where you can run a mix of the GX and non-GX if they’re both good and have some synergy. Vikavolt is one of the Pokemon to get this treatment. I don’t think you would ever build a deck around Vikavolt GX, but it’s a solid attacking option in decks built around Vikavolt SUM, which accelerates a Lightning and Grass Energy. Super Zap Cannon is a big hitting attack, hitting for 180 damage and being able to be recharged every turn with the other Vikavolt’s acceleration. Gigatron GX is a potentially solid spread attack in a format in which more low HP pre-evolution Pokemon will see play. However, I don’t think this will actually be too effective in that regard as by the time you get this thing out your opponent should be setup. However, it still should be sometimes effective for setting up knockout math. Tapu Koko GX is going to be very important in shaping the format as we head towards the US International Championship. It gives us a very powerful Lightning attacker that can’t be exploited for weakness. This is definitely bad news for Yveltal EX decks, but could be bad news for M Rayquaza EX decks as well, assuming this is played alongside Parallel City or Sudowoodo. M Rayquaza EX certainly has much better counterplay against it than Yveltal EX does, however, as it more easily OHKO’s it. Headed into next season, we already know that Super Scoop Up will be re-entering Standard format at some point, most likely with the August set, giving you the option to pick up damaged Tapu Koko GX’s throughout the game putting the onus on your opponent to OHKO it. Tapu Thunder GX is also a solid attack against anything that sets up a field full of Energy to attack. It’s somewhat situational and won’t be good against every deck, but it shouldn’t be too difficult to find those situations where its good in. Trashalanche is a format warping attack that completely changes Standard at the very least. Even Vileplume Item Lock decks are playing 15 Item cards which would let Garbodor hit for 300 max damage. A deck like Turbo Darkrai EX plays around 26 Item cards, puting Trashalanche’s max damage at 520 damage. The current format is very Item dependent and Garbodor will be lingering around waiting to punish players for playing their item cards. As it only costs 1 Energy to attack, and is a Stage 1, it’s not too difficult to build decks that fit it in. Luckily Trashalanche costs a Psychic Energy, meaning that it won’t be able to go in every deck without doing some teching in the Energy department. It’s hard for me to see a world where Garbodor doesn’t end up being very powerful. Trying not to play your Item cards doesn’t seem like it would be an effective strategy as Garbodor would presumably be paired with something that will put pressure on you forcing you to play the game more actively. Maybe the format develops in a way where players start playing more Supporter cards/draw Abilities and less Items? Garbodor breaking onto the scene is probably very bad news for the competitiveness of Psychic Weak Pokemon such as M Mewtwo EX and Espeon GX. Speaking of replacing Item cards with Abilities, Oricorio provides an example of that. Its Vital Dance Ability has the same effect as Professors’ Letter, just on a Pokemon, making it searchable with Ultra Ball and Level Ball, and also allows you to use this type of effect without an Item card which could be used to play around Garbodor as previously mentioned. Professors’ Letter hasn’t been played at all recently, but there was a time where it did see quite a bit of play. I could see Oricorio being a decent inclusion in decks like M Gardevoir EX or M Rayquaza EX that need to fill their bench and can sometimes struggle to find Energy. Oricorio is the long awaited hard counter to Night March decks. With a Colorless attack cost to its Supernatural Dance attack, Oricorio can easily be slotted into any deck. It allows you to place 1 damage counter on your opponent’s Pokemon in any way that you like. This is devastating to both Night March and Vespiquen decks, being able to knockout 2+ Pokemon when timed correctly, which when put on a non-EX is more than enough to turn the tide of a game against these decks. I don’t think it will see play in Standard as Vespiquen has fallen out of favor, but I would expect this to significantly hurt Night March in Expanded, as any deck with a bad Night March matchup can fit this into their deck and probably make it a favorable matchup. This will lead to Night March being a super high variance deck in Expanded, where players that are lucky enough to avoid Oricorio can still do well with it, while those that are paired against Oricorio players will do bad. Night March is enough of a problem and this is a simple enough solution that I do think people will tech it, but if people stop playing Night March it could find its way coming out of decks which could re-open things for Night March to do well again. Verdict: Certified Night March killer….when people play it. (Has Potential – High). Ultra Toxic Poison has a good effect for an attack, but requiring three Energy attachments for it is too costly, so it would be be too difficult to setup consistently. Its GX attack, Toxa-Shelter GX is a pretty solid one, dealing 150 damage and preventing all effects of attacks, including damage during your opponent’s next turn. This effect essentially means that Toxapex GX can gain what is essentially an extra attack on opponents in most games it plays. I really like Ultra Toxic Poison and Toxa-Shelter GX, but I think both are too costly that I can’t see this getting play. We have seen these types of damage boosting Abilities in the past and they always have the potential to be strong, as long as there is something to work with. The most similar recent card to this that performed well was Deoxys EX from Plasma Freeze which boosted the attack damage from Team Plasma Pokemon by 10 for each Deoxys EX. Evolution cards with an even stronger effect, such as Altaria DRX, have also seen some success. Another recent card like this, Regirock EX, however hasn’t been able to find a deck that it is relevant in. Dhelmise’s potential hinges on there being Metal Pokemon that are almost meta relevant, but who need a damage boost to hit some important magic number. A popular one that has been pointed out quite a bit already is Dhelmise allowing M Scizor EX to hit for 130 damage. Not sure there is too much for it to work with right now, although it does put stuff like Magearna EX into pretty good damage numbers and allows Cobalion EX to hit for lots of damage for a single Energy with its disruptive Righteous Edge attack. Tapu Lele GX breaks new ground for EX/GX consistency cards in that players will not be punished in any way for playing the card. Past consistency cards, such as Shaymin EX and Jirachi EX, both came with very low HP for EX’s making them a potential two easy prizes for the opponent. Tapu Lele GX, with its 170 HP can safely sit on the bench and not be punished. There was a lot of clamor from some veterans of the game that a big issue with recent Pokemon formats is that you are punished for running consistency cards. With Tapu Lele GX, it appears Pokemon has listened to their thoughts on how consistency should be encouraged and not discouraged. The primary reason for playing Tapu Lele GX is for its Wonder Tag Ability which is a reprinting of Jirachi EX’s Stellar Guidance Ability which had been pretty solid both in its original Standard format as well as in recent Expanded formats. Being able to convert an Ultra Ball into a Supporter card increases the number of consistency outs in a deck making them inherently more consistent and reducing the number of games that players lose to dead draws. Energy Drive is a reprinting of Mewtwo EX’s X-Ball and Lugia EX’s Aero Ball. This was one of the most dominant attacks to be released when the original Mewtwo EX came out in Next Destinies, but has since lost some of its punch as time went on and power creep made other stuff stronger. Make no mistake about it though, this attack is still a very good attack and has been relevant in the current formats with Lugia EX being one of the primary attackers in the BDIF, Decidueye GX/Vileplume AOR. Its GX attack isn’t very good and is very situational. It will only be used sometimes in Psychic decks. Tapu Lele GX is the best card in Guardians Rising and will be an instant 1-of in most decks, with some niche decks choosing to play multiple copies. Verdict: Best card in set – Superstar. Machoke is another in a long line of cards Pokemon is releasing which “technically” counter some relevant problem in the format, but because they’re a Stage 1, they’re too clunky that no one ends up playing them. Machoke is in particular a bad counter to Decidueye GX because of how easily Decidueye GX can knock it out. As Machoke only protects benched Pokemon, a Decidueye GX can use Feather Arrow on Machoke if it uses Lysandre to bring it Active and then it can be knocked out with Razor Leaf. That’s if you can even get Machoke out under Item Lock. In a good number of games your Machop would probably get knocked out before you get a chance to evolve. If a relevant Machamp gets released then this will be a nice little feature of that deck, but on it’s own this card won’t effectively act as the counter it was made to pretend to be. Sudowoodo is the good side of niche counter cards as it is a Basic Pokemon card making it much easier to get into play compared to a card like Machoke. This is primarily a counter to M Rayquaza EX decks, although it also counters decks like M Gardevoir EX, Rainbow Road, among others that like to play around with a larger bench. (Basically it’s a counter to Sky Field decks). The only way for these decks to effectively deal with it is to knock it out, as cards like Hex Maniac are only temporary, very weak fixes to the problem it presents. Sudowoodo only targets your opponent’s Bench, so Sky Field decks can actually use it to counter other Sky Field decks. Lycanroc GX’s Bloodthirsty Eyes Ability gives an automatic gust effect. This is a nice effect for any Lycanroc GX deck as it will allow them to use their Supporters for draw and other effects while using the Ability when they want a gust effect. It could also become relevant as a general tech in the post-Lysandre format coming after Ancient Origins presumably rotates in September, however I would imagine most players would opt to play Pokemon Catcher over this. Claw Slash does a solid 110 damage, and isn’t too difficult to power up thanks to it only needing 1 Fighting Energy and a Duble Colorless attachment to setup. That hits enough for a 2HKO on most Pokemon, especially if the Fighting requirement is fulfilled with a Strong Energy. If you power it up with a couple of Strong Energy, most likely with Carbink BREAK, then you can start to get into OHKO range when you add other damage modifiers into the mix. Dangerous Rogue GX is a good GX attack that should be able to find spots to pick up OHKO’s. Most decks play with 4 Pokemon on their bench at some point in the game, so if you use it at the right time it shouldn’t be too difficult to pick up a OHKO with it. Minior does an absurd 190 damage for a Basic Pokemon for only 3 Energy. It does come with the drawback of knocking itself out, but it could be good for some cheap knockouts that swing games if timed correctly. Sableye has been getting a bit of hype, but it seems relatively weak, especially initially when most decks will have Ability based draw outs with Shaymin EX. The primary pairing people are talking about is using Sableye with Decidueye GX, but I don’t think that will be a viable strategy just because of how easy Sableye will be to knockout. The opponent will always have 1 turn at least to use Supporters, and if they don’t draw terribly on the first turn they should be able to setup an easy response to Sableye and knock it out to regain access to Supporters. In particular, Tapu Lele GX, which will be in every deck, can easily knock it out for only a DCE attachment. It could be situationally effective as a 1-of non-EX in some Darkness decks to buy you an extra turn to find resources to close out a game by preventing something like a game winning Lysandre, but even then you have to devote your attachment to turn to it, making it difficult to use it to stall to setup something behind it. Metagross GX is a super interesting card as it gives acceleration to both Psychic and Metal types, increasing the amount of decks which can potentially be built with it. The most obvious partners for its Geotech System Ability is Genesect EX FCO and Solgaleo GX. I’m not sure that a Psychic Pokemon exists yet that I would want to use this Ability to accelerate to. Giga Hammer is a solid attack, but falls a little bit short from where you want to be damage wise. However, this could be fixed by adding Choice Band and Dhelmise to the deck. While Dhelmise isn’t something you would want to build a deck around, if you are using it for its Ability in a Metagross GX deck to boost Metagross’ damage output, you could tech in some Psychic Energy to activate it as an attacker. It can swing up to 200 damage with Choice Band against anything with Psychic Weakness. Algorithm GX is a solid GX attack which can help you setup additional Metagross GX to fully develop your field. Being a Stage 2 Pokemon makes me somewhat worried for this card actually doing well as Stage 2’s don’t have a good track record as of late, but with 250 HP and Energy acceleration packed in I think this is one with decent potential to break through and do well. Volcanion EX will be a problem, especially if it jumps to BDIF status, but most decks have some bad matchup based on typing already, so there should still be plenty of metas for Metagross GX to do well. Solgaleo seems like a solid stable attacker in Solgaleo GX decks. As you are already running Cosmog and Cosmoem for your Solgaleo GX, fitting in Solgaleo into the deck is very easy as the structure for it is already in place. This Solgaleo gives Solgaleo GX decks an attacker that they can use that is somewhat bulky and doesn’t discard its Energy putting you under less strain for maintaining the Energy you need to attack. Fangs of the Sunne’s 170 damage is a solid amount, able to OHKO a fair amount of Pokemon. It can be reset every turn with Solgaleo GX’s Ultra Road Ability allowing it to attack every turn. These types of cards never seem to pan out, and as a Stage 1 it’s too costly to really fit into any decks. With so many Switching effects, and the ability to retreat to play around it, it’s too easy to make The Wages of Fluff a wasted attack. Sylveon GX will stand in for Lapras GX as the primary disruption based deck in the format. You will be able to evolve into it on the first turn of the game by attaching a Fairy Energy to the Eevee from Sun and Moon with Energy Evolution and then get to using Magical Ribbon. Lapras GX depends on raw draw to garner the resources to pull off its disruption strategy, using its Collect attack in the early game to stockpile resources. Sylveon GX on the other hand depends on precision for its disruption, letting you choose the exact 3 cards you feel are the best to have with its Magical Ribbon attack. If your opponent gets too strong of a board presence setup, you can send two of their setup Pokemon back to their hand with Plea GX. This is in particular good against decks that depend on evolving Pokemon to execute their strategy, decks that rely on the Max Elixir engine, or decks that need to make multiple Energy attachments in setting up their attackers. I think Plea GX is one of the reasons Pokemon gave Tapu Lele GX the attack they did. This helps limit Sylveon GX’s dominance as every deck will have a Pokemon that can 2HKO a fully powered up Sylveon GX that they’re trying to attack with. Fairy Wind is a very vanilla attack, but 110 damage is effective for getting 2HKO’s against most Pokemon, so after you do a bunch of disruption it’s plenty good enough to finish out games with. Comfey follows along the lines of Pokemon like Virizion EX that have prevented Special Conditions in the past. These cards are fairly straight forward, in formats where Special Conditions are relevant, Comfey will become beneficial to any deck that can take advantage of it, and in formats without relevant Special Conditions or a good deck that can take advantage of Fairy Energy it will be useless. Like Frogadier before it, Sliggoo’s Division cheats the typical evolution rules. It’s a little less effective than Frogadier’s Water Duplicates attack, but even getting two extra Stage 1’s into play is very strong. Unlike Frogadier, Sliggoo doesn’t have a good evolution card. None of the Goodra cards released to date, including the one in Guardians Rising is worth building a deck around. Verdict: Dependant on a good Goodra being release – Has Potential (Goodra dependant). Drampa is a spiritual successor to Tornadus EPO. That card has long been power creeped out of the format, but Drampa’s attack is able to move Special Energy to the benched Pokemon, similar to Yveltal EX’s Y-Cyclone, making it a bit more powerful. With Choice Band, Drampa can hit for 110, good to 2HKO anything with 220 HP or less while setting up other Pokemon on the field with Energy. I think it most likely will stick in people’s binders, but there is some potential for play as it has some decent survivability at 120 HP and helps conserve Energy while being able to dole out 2HKO’s against a lot of stuff, as well as OHKO pre-evolutions. This is probably the worst GX Pokemon that has been made thus far. It’s a Stage 2, making it already difficult to get into play, but then it needs 4 Energy to use its primary attacks. It having a Shred attack makes me think that it’s supposed to be playable, but it will need some type of support from a future set to help get it into play and attacking. Verdict: The worst GX card ever printed – Bust. While healing 80 damage from your Pokemon is a solid effect, I can’t see people playing a 4 retreat Stage 1 to do so. Even Blissey cards with better Abilities, such as Blissey DEX, never saw significant play for their healing Ability in slower formats, so I can’t see a Blissey with a one time use Ability being played in formats with as many OHKO attacks as we now have. I expect Rayquaza to be one of the most important cards to come out of Guardians Rising and a card we will see pop up in a variety of different decks. I think it’s a natural fit in decks like Yveltal EX which already play both Double Colorless and Basic energy, but I think the effect of attaching two Energy cards from the discard pile is so strong that there will be plenty of decks that specifically play Double Colorless Energy to take advantage of Turbo Storm. Something interesting to note is that Rayquaza also has a revelant 2nd attack in Dragon Claw, which combos fairly well right after a Turbo Storm. If you have a Choice Band attached to Rayquaza for both attacks you get a combined 170 damage from the two attacks, good enough to knockout some EX and GX Pokemon. Getting to draw 3 cards with Rake It In would be a strong Ability if Bewear had a better attack. Unfortunately Dangerous Blow, what once would have been a strong attack, is too situational to be part of strong strategies as the format has moved more towards Evolution decks. Drampa GX is another very strong Colorless GX Pokemon that can fit into any deck, similar to Tauros GX. Its Righteous Edge attack gives it disruption against decks playing Special Energy. A lot of the GX Pokemon have two Colorless requirements in their attack cost, which means that many players would play Double Colorless Energy to fulfill that attack cost, so Drampa GX can disrupt against those Pokemon some. Its Berserk attack is going to be very strong in any deck that forces the opponent to 2HKO stuff. If something gets damaged, but isn’t knocked out, you can send up Drampa GX to go Berserk on them for 150 damage…or 180 damage with a Choice Band, which can knockout a fair amount of EX and GX Pokemon. Its Big Wheel GX attack isn’t as game changing as other GX attacks, but it is a solid consistency out to have. It also is one of those GX attacks that can easily be used in the early game to unlock Hala’s full potential early. Speaking of Hala, this new Supporter card gives us one of the stronger Shuffle and Draw effects in the Standard Format. I don’t think Hala will be a card that goes into every deck, but I think there will be a very specific set of decks that use an early game GX attack and can take advantage of Hala for a draw 7 early and often. Cards like Drampa GX and Turtonator GX have GX attacks which can be used very early on allowing their decks to make very good use of Hala. In decks that typically use their GX attacks in the mid or late game I think it’s probably best to pass on Hala. Mallow is a reprint of the Supporter card Oracle from Skyridge. While that card saw play back then, the past few formats have been so fast that it’s hard to see a card like this creating enough of an advantage to warrant being played over cards like Professor Sycamore or N when building a deck engine. As of right now there aren’t enough Supporter cards release in the Sun and Moon set block to predict whether or not it will see play in that format. With the current Supporters released so far, I think there could be room for Mallow. However there are still 5 more sets to be released before we would even get to a Sun and Moon-on format, so there could easily be Supporters released that outclass it by the time we get to that. Professor Sycamore and N will be around until that rotation, and these cards are so good its hard to see Mallow becoming a key Supporter card before rotating them out. However, in decks that use cards like Alolan Sandlsash or Octillery BKT, I could see Mallow being included as a tech Supporter card, essentially a double Computer Search in Supporter card form. This probably becomes worse over time, but until VS Seeker rotates you could pick your spots to where you would use this. Since its release in Dark Explorers, Dark Patch has been relevant in every format since its release. This type of Item based Energy Acceleration is super strong so it’s difficult to see Aqua Patch not following a similar path. In Standard format, I think Lapras GX is probably the best early partner for Aqua Patch. Palkia EX, Glalie EX, Huntail PRC and M Gyarados EX are some sleeper options worth exploring in Standard. In Expanded, I think it makes Seismitoad EX absurdly powerful by giving it much easier access to Grenade Hammer. We may finally see an Expanded Waterbox see some success. There are enough interesting Water attacker in format that I have to imagine that we will see some successful Aqua Patch decks upon initial release, as well as many more into the future as more Water attackers are released. Energy Loto provides some additional outs for decks in which it is vital for them to find a specific Energy card. For example, a Seismitoad EX deck would like to see Double Colorless Energy on their first turn to get off the turn 1 Quaking Punch, so they could play Energy Loto to increase the probabilities of finding that card on turn 1. I think this card will very rarely be used, but it’s difficult to see there not being some deck pop up in its lifespan that takes can take advantage of it. It has been 8 months since we last saw a legal Item based Tool Removal card in Standard, but now we have a new one in Field Blower, which also can be used to knock Stadium Cards out of play. Upon release Field Blower will do a lot to shake up the format. Garbodor BKP will be further weakened as any deck with Field Blower can gain back access to their Abilities. Exp. Share based decks should cease to be a thing (bye Turbo Darkrai), and Fighting Fury Belt will be less effective. I love that Pokemon added the Stadium effect onto here as well. This makes it a versatile card that can be used in a variety of different ways which I think will increase the skill of the format as players have to figure out what threats are best to remove between two different card types. In Expanded, this will instantly replace Tool Scrapper in any decks that played that. There can still be some argument for playing Startling Megaphone over this, as it can remove more Tools, but I think most players will opt for Field Blower for the versatility it provides in being able to also remove Stadium Cards. This is a reprint of Energy Recycler, which was last printed in Ancient Origins, which means this will continue to be legal in the Sun and Moon-on format. This card has never seen too much play, but with Super Rod rotating out of Standard it may start seeing play in decks that need to recycle Energy back into the deck. Super Rod has received more play because of its versatility, and also because in many instances only putting 3 cards back into the deck is better than putting 5 cards into the deck. Enhanced Hammer, which was last printed in Primal Clash, gets a Sun and Moon era reprint keeping it legal moving forward. This card has been good in almost every format it’s been legal (Lost Remover was better upon initial release, but Enhanced Hammer was a logical replacement once that rotated). With lots of cards that work off of Double Colorless Energy attachments already released in Sun and Moon, I see no reason why Enhanced Hammer won’t continue to put in good work. Multi Switch is a card that seems made for moving around Special Energy cards for decks that are generally reliant on multiple Energy attachments to get setup. When I envision using this card, I think of something like an Umbreon GX deck where you need two attachments to get going. With Multi Switch, once you have a single Double Colorless Energy on the field, you can move that around to other Pokemon, such as a Zoroark, or another Umbreon GX, allowing you to skip an Energy attachment on one of the Pokemon that you bring into play later on in the game. The card is very deck specific, and even very situational within those decks so there is a good chance it wouldn’t even be worth running. If you’re using it to move around Special Energy cards, Enhanced Hammer can eliminate its usefulness. Rescue Stretcher is a very solid Pokemon recovery card that instantly will outclass similar cards like Revive and Buddy Buddy Rescue and become the default recovery card for Pokemon in decks that only are looking to recovery Pokemon and not Energy as well. In decks where recovering Energy is still important, Super Rod still should be the play. As is, Rescue Stretcher is essentially an option between being a one sided Buddy Buddy Rescue or being a Super Rod for Pokemon only, both very strong options for Pokemon recovery. Not too many decks played Buddy Buddy Rescue, but this obviously becomes a replacement for that in Gyarados decks, Night March decks which ran it, and even a deck like Vespiquen can probably cut back on one of the Revitalizers to fit this in. Choice Band is essentially an upgraded Silver Bangle that is able to work against both EX and GX Pokemon, and can also be attached to EX/GX Pokemon, not being limited to being attached to only non-EX(/GX) Pokemon like Silver Bangle previously was. I would expect this to become one of the most popular Tool cards in the format upon release. I could still see Big Basic decks trying to use Fighting Fury Belt still if Choice Band doesn’t unlock new damage math for a deck, but otherwise non-EX/GX decks as well as evolved GX decks will all head towards Choice Band as their preferred Tool Card. Even most Big Basic decks may opt for Choice Band because Fighting Fury Belt will become less effective with Field Blower now around to remove it to get rid of the HP boost on Pokemon that it’s attached to. This is one of the coolest cards in the set and can be used by Grass/Lightning decks to create an advantage for themselves by taking away certain knockout math. As it is a Stadium Card, it can easily be played around by playing down a different Stadium Card or using a Field Blower, so it’s not something that you can base an entire strategy around, but even getting it to stick 1-2 turns throughout a game could potentially be enough to mess up knockouts for your opponent allowing you to get ahead in the prize race. Altar of the Moone very likely will become played as one of the default Stadium cards in decks based around Darkness or Psychic Pokemon. With most Pokemon having retreat costs of two or less, Altar of the Moone will essentially give most Pokemon with Darkness or Psychic Energy free retreat. Adding mobility to decks generally lets them function better and lets you have more optimal turns as you have easier access to getting the optimal Pokemon into the Active position for the end of your turn. Free retreat has been a staple of Expanded Dark decks, so I would expect players playing Yveltal and other Dark decks in Standard will probably try to get this card into their decks. Removing weakness is a good effect, but having it come in Stadium form has mostly proved ineffective as all it takes is a your Stadium being bounced for you to be getting hit for weakness again. Brooklet Hill seems like a solid Stadium option for Water and Fighting decks. It’s a very simple effect helping Water and Fighting decks be able to use their Stadium card to setup their field. In the context of cards like the new Garbodor, being able to use your Stadium to setup your field instead of Item cards could be a benefit to Water and Fighting decks for helping them keep down the amount of damage Garbodor can do. As Pokemon did with Sun and Moon, Guardians Rising has a random Basic Energy card included as an 11th card in every pack. In addition to the Basic Energy in the set, there are Secret Rare Gold versions of Double Colorless Energy, Grass Energy, Lightning Energy, and Fighting Energy. Guardians Rising is an amazing set that is loaded with a large amount of cards with strong possibilities. Like May sets of the past, Guardians Rising is a set that can turn the meta game on its side. Yveltal EX and M Rayquaza EX decks now have a new Basic Lightning attacker to deal with in Tapu Koko GX, M Gardevoir EX and M Rayquaza EX both need to sweat Sudowoodo, Vespiquen runs into some problems with Oricorio, tool removal should kill Turbo Darkrai, and eveything needs to worry about the new Garbodor…although M Mewtwo EX players should be especially worried about the new Garbodor. Unless you’re a Volcanion EX or Decidueye GX player, your primary deck probably became worse…and even if you’re a Decidueye player, you’re not going to be happy when you find out that the Volcanion players are going to be very happy with this set. While I don’t think all of the old decks will be done for come Nationals, especially ones like M Rayquaza EX that require the opponent to actually play a card like Sudowoodo to gain an advantage over you, Guardians Rising does enough to push the meta game away from XY concepts and more towards Sun and Moon concepts as we head towards the largest event of the year, the US International Championship. Click on a card to go directly to the review of that card. “Tool removal should kill Darkrai”. I seriously doubt that field blower (a one-off in most decks) is going to make a tier 1 deck irrelevant throughout the format. The writer either has some beef with Turbo Dark or is sorely mistaken. Very good overview of the set, Andrew. I think you are underestimating how good the new Lycanroc GX will be (especially next Standard format) as a main attacker in decks. I can see a modern Luxchomp type deck showing up on the scene. We will see, though.